The refresh to Tampico’s brand and labeling is designed to offer a more fun, adventurous and uplifting aesthetic, instilling a spirit of discovery and joyful moments into loyal brand fans and new-to-Tampico consumers alike. The new logo, with juice droplets emanating from the Tampico name, is designed to symbolize a burst of flavor, with the letter “o” converted to a smile that conveys the fun found in Tampico juice drinks. “Our brand refresh is all about reinvigorating the Tampico experience for our consumers,” said Gerdes. 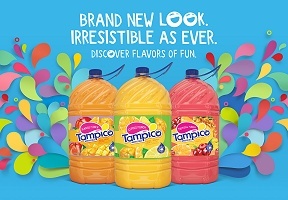 “Our new look captures our consumers’ desire for creating joyful moments, while still preserving Tampico’s tradition of trusted quality, excellent value and unique flavors. We are thrilled to embrace the new way of expressing our ‘Irresistible’ brand essence as a state of being ‘Imaginatively Curious.’” The brand refresh is simultaneously being rolled out across Tampico’s products and digital properties, including its website (www.Tampico.com), blog (www.TampicoIsColor.com), Instagram (@TampicoOfficial), Facebook (@DrinkTampico) and Pinterest (@TampicoOfficial).